Apparently it's Tennessee Williams month in Minnesota. Last month I saw his iconic play A Streetcar Named Desire at the Guthrie, and last night it was another classic, The Glass Menagerie, at The Jungle Theater. The Jungle is a lovely little intimate theater in the Uptown area of Minneapolis. I've been there a few times; the last time was for the awesome rock musical Hedwig and the Angry Inch two years ago. I need to go more often, because they do good work. Their upcoming season (unlike most theaters, their season runs concurrent with the calendar year) includes the Stephen Sondheim musical A Funny Thing Happened on the Way to the Forum and I Am My Own Wife with one of my favorite actor/singers, Bradley Greenwald. But back to the show at hand. I've seen The Glass Menagerie a few times before (most recently at the Guthrie three years ago), and I've always loved it. 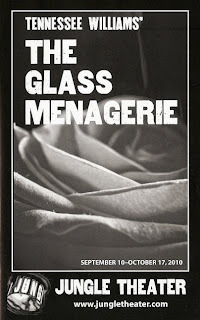 There's something so beautiful and tragic about Laura, who's more comfortable with her collection of little glass animals than with people, her mother, who's living in her glorious past as a debutante in the South, and her brother Tom, who's trapped between wanting to take care of them and wanting to live a life of his own. I jumped at the chance to see it again at the Jungle with this talented four-person cast, three of whom I've seen and enjoyed in other shows. Wendy Lehr plays the mother, Mrs. Wingfield. Friends, if you have the chance to see Wendy in anything, take it. I've seen her in several things in the last few years (including as Big Edie in Grey Gardens, and stealing every scene she was in in The Full Monty), and she's always amazing. She inhabits whatever character she's playing fully, and has this great spark and stage presence that's much bigger than her petite frame. She's also hosting the Ivey Awards (Minnesota's version of the Tonys) next week, along with the Jungle's founding Artistic Director, Bain Boehlke. Her Mrs. Wingfield is equal parts charming belle of the ball, "Christian martyr," and overbearing mother, all of it entertaining. Laura is played by Alayne Hopkins, who I've never seen before but who portrayed Laura's fragility and pain very well. Her brother Tom is played by Joshua James Campbell, who I most recently saw as the host of the cabaret show Where's My Tony? Josh was also in Grey Gardens and The Full Monty (which I believe is making a reprise at the Iveys next week). The three made for a very believable dysfunctional family. I particularly liked the chemistry between Wendy and Josh. One of my favorite scenes was when Tom and his mother were on "the terrace," aka the fire escape, wishing on the moon. He was leaning over on the railing, and she leaned over and put her head on his shoulder as she talked about how she wished her children success and happiness. It was such a sweet scene, and illustrated that she really did love and want the best for her children, even if she might not have gone about it the right way. Of course there's one more character in the play, the gentleman caller, "the long delayed but always expected something that we live for." And can't we all relate to that? The feeling that there's something good and exciting coming, something that will make our lives better? Michael Booth (a frequent cast member at the Guthrie) plays Jim with just the right amount of charm and bravado. For those of you unfamiliar with the play, Mrs. Wingfield's main goal in life is to find a husband for her "crippled" and painfully shy daughter so that she will be taken care of, and enlists Tom to bring home a nice young man from his workplace. When the gentleman caller finally arrives, Mrs. Wingfield makes a big fuss over it and puts pressure on Laura to be pretty and perfect, which only makes her more nervous. The scene when Laura and Jim are alone together is all sweetness and awkwardness, and actually goes quite well, considering, until it's revealed that he's engaged to be married. I wish they could have seen this evening as a successful dress rehearsal for the next gentleman caller, who hopefully would be more available. But instead, Laura is devastated and Mrs. Wingfield is angry at her son for humiliating them. Tom leaves to find his fortune in the merchant marines, but can never quite leave the image of his sister behind him. A classic play, one of America's greatest playwrights, a talented cast, a lovely intimate space - all reasons you should go see this play before it closes on October 17! As they say at the Jungle, "Epic theater, intimate space." i cry just thinking about this play. i'm so jealous that you got to feel it in person.